The Episcopal Church of Saint Mary is a Christian community that worships together in the Anglican tradition. What is “the Anglican tradition”, you ask? Anglican is an old way of saying “English”. This tradition is what developed in the British Isles throughout the 2000 years of church history in those distinctive lands. As it is practiced today, the Anglican tradition is a unique blend of Roman Catholic, Eastern Orthodox and Protestant worship practices. Anglicans are intentional about incorporating the best worship practices from every branch within the Church. But we are not very interested in the latest fads or trends. Rather, we are intentional about faithfully continuing the worship practices of the early Church (the critical developmental period from 30 to 400 AD). At a typical celebration of the Holy Eucharist at Saint Mary’s, you will enter a traditional and beautiful Sanctuary designed to stimulate your senses. There are candles, bells, huge stained glass windows, crosses, singing choirs, processions of people, kneeling worshipers, freshly-cut flowers, and much more. At the appointed time, we gather together to pray through the Church’s liturgy. “Liturgy” comes from ancient Greek, and it roughly translates as “work of the people”. Worship is what we do together. It is always a communal experience. Many of the prayers come from Eastern Orthodox sources; others come from the Roman Church and others from the Protestant tradition. The “work of the people” includes hearing and responding to the Holy Scriptures as we have received them in the Bible. At every liturgy, there is at least one passage from the Bible proclaimed in our midst (typically there are two) and one of the Psalms is prayed together as a community. A sermon is offered to help us understand these ancient texts and apply them to the concrete realities of our daily lives. All of this is designed to allow us time to meditate together upon the sacred texts of the Bible. We also sing together – a lot! Many of our songs are ancient chants from monastic sources; others are songs written in the 20th century. Most of all, we sing together the classic Anglican hymns – sung to the accompaniment of our magnificent organ. At the liturgy later in the morning, our Choir leads the singing and offers special anthems to encourage and inspire our spiritual lives. And we also eat together at nearly every liturgy. We share in a symbolic meal which the Church calls Holy Eucharist. “Eucharist” also comes from ancient Greek and it means “thanksgiving”. We gather around the Lord’s Table and give thanks to God for creating all things, for loving all people, for redeeming the world through our Lord Jesus Christ, and for the gift of the Holy Spirit who unites us with Christ in a living relationship every single day. Baptism is the only requirement in order to join us at the Lord’s Table. 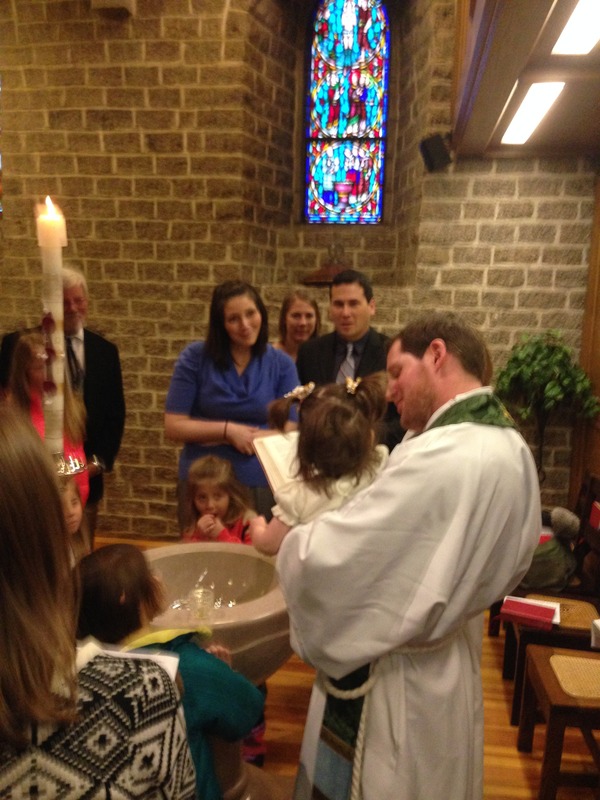 And not just an Episcopal baptism. Any baptism with water in the name of the Father, the Son and the Holy Spirit is recognized as true and valid. There are no second class citizens in the kingdom of God. Every baptized person is part of the family of Christ and is welcome to eat at the family Table. Praying, meditating on the Scriptures, singing, eating – all of these are shared spiritual practices in our liturgies every Sunday morning and on other holy days. These liturgies provide us with a pattern for worship which is predictable without being boring. This ancient liturgy offers a communal spiritual experience in which everyone present has a role, and which creates space and time for each of us to renew our commitment to Jesus Christ.